Poultice to remove pig graffiti. Photo: NPS files. Removing graffiti as soon as it appears is the key to its elimination—and recurrence. Thus, the intent of this Preservation Brief is to help owners and managers of historic masonry structures find the best way to remove exterior, surface-applied graffiti* quickly, effectively, and safely. The Brief will discuss the variety of materials used to apply graffiti, and offer guidance on how to remove graffiti from all types of historic masonry without harming either the surface or the substrate. Suggestions will also be given regarding the use of physical barriers to protect masonry surfaces from graffiti, and the application of barrier coatings to facilitate graffiti removal. Building managers and owners of historic properties will be advised on the importance of being prepared for rapid graffiti removal by testing different cleaning techniques in advance in order to select the most appropriate and sensitive cleaning technique. Health and safety and environmental concerns are addressed, as well as regulatory matters. Removing graffiti without causing damage to historic masonry is a job for trained maintenance crews, and in some cases, professional conservators, and generally should not be attempted by untrained workers, property owners or building managers. Although the focus of this Preservation Brief is on historic masonry, the same guidance may be applied equally to removing graffiti from non-historic masonry. Successful graffiti removal from historic masonry depends on achieving a balance between breaking the bond between the graffiti and the masonry surface without damaging the masonry. This generally requires knowledge both of the materials used to make the graffiti and the masonry on which the graffiti has been executed, as well as knowledge of cleaning methods and materials. Without this, masonry surfaces can be badly disfigured or damaged during graffiti removal. *The word graffito (graffiti, plural)—is derived from the old Italian diminutive of graffio-to scratch, and the Latin graphire-to write. Graffiti in contemporary usage has come to mean an inscription, drawings, or markings. Except in very formal or technical applications, graffiti is generally considered a "mass" noun and paired with a singular verb. Inappropriate abrasive blasting to remove the graffiti has permanently etched the graffiti into the stone. Photo: NPS files. Most graffiti is made with spray paints. Although a number of solvents and paint strippers are capable of dissolving or breaking down these paints, some may permanently discolor or stain the masonry surface if not used correctly. As a result, the remaining paint may become more difficult, or even impossible, to remove. Poorly thought-out and generally hasty attempts to remove graffiti using harsh chemicals or abrasives can also cause permanent damage to the masonry that may be worse than the graffiti. Removing this densely painted graffiti will require several applications of paint remover. Photo: NPS files. The ability to identify the graffiti material is an important step in successful removal. Numerous kinds of spray paint (polyurethanes, lacquers, and enamels), and brush-applied paints (oils and synthetic resins such as vinyls, acrylics, acetates, methacrylates, or alkyds), as well as permanent felt markers are the materials most often used to make graffiti. But other materials are also used for graffiti, including water-soluble felt markers, ballpoint pens, chalk, graphite and colored pencils, pastels, wax and oil crayons, liquid shoe polish, and lipstick. The range of materials adopted by graffitists continues to expand. Paints are composed of pigments that provide color and hiding power; binder that holds the pigments together and to the substrate; and a solvent that allows the pigment/binder mixture to flow. Some spray paints and markers may contain dyes instead of pigments. Paints are applied wet. Generally, as the solvent evaporates, the binder solidifies. The greater the solvent content of the paint, the greater the flow rate, and thus, the greater the ability of the paint to penetrate into masonry pores. 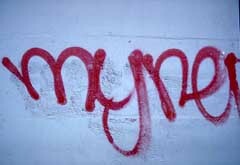 The two primary components contained in most graffiti materials—pigment or dye, and binder—may simply remain on the masonry surface, or penetrate into the masonry to varying depths depending on a number of factors, including the surface tension of the substrate and viscosity of the solvent or vehicle. Thus, even the total removal of the pigment or the binder may leave residues of the other component actually in, or below, the surface of the stone. Residual stains, or graffiti "ghosts," such as those from any kind of red paint or the fine black pigments used in spray paints, may be particularly difficult to remove. With painted graffiti, it is helpful to establish how long it has been on the surface. For most paints that have been on the surface for several weeks or months, hardening processes are likely to be complete or well-advanced; the solubility of the paint is proportionately reduced and it will be more difficult to remove. The historic masonry substrate must also be identified. As used here, the term masonry encompasses all types of natural stones; manufactured clay materials, including brick and terra cotta; and cementitious materials, such as cast stone, concrete and mortar. The common factor among masonry materials is that they are porous, to a greater or lesser extent, and sensitive to abrasion. After identifying the masonry, its condition, including fragility, porosity and permeability, must also be assessed prior to beginning graffiti removal. For example, a smooth, newly-polished granite surface is comparatively easy to clean because it is relatively impermeable and paint vehicles tend to stay on the surface rather than penetrate into microscopic pores. A very smooth, polished surface also has no pits or crevices that will retain particles of pigment or binder. 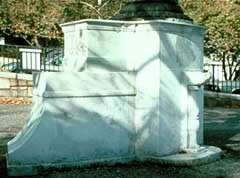 In contrast, weathered marble or limestone may be extremely porous and permeable, with a rough surface on which particles of pigment can easily lodge. The fragility of such a surface can make it impossible to clean the surface even with a bristle brush without risking severe surface loss. A difference in surface texture or finish may also be the reason that a particular cleaning agent will work in one situation but not another. Spray painted graffiti defaces this historic brick building. Photo: NPS files. Some types of masonry may react adversely to contact with the various cleaning agents required to break or dissolve the bond between the graffiti and the masonry surface. Thus, for purposes of cleaning, masonry types are often categorized according to whether they are acid-sensitive, non-acid sensitive, or alkali-sensitive. Acid-sensitive stones consisting of carbonate materials may be damaged or even destroyed by contact with acids. Although, in many instances, acidic cleaning compounds are not effective for graffiti removal and generally should not be used for this purpose, it is useful to know that some acid-sensitive materials include: stones such as limestone, marble, travertine, calcareous sandstones and shales; most polished stones; and glazed architectural terra cotta and glazed brick. Non-acid sensitive masonry materials include slate, granite, unglazed architectural terra cotta and unglazed brick. Alkali-sensitive stones may contain silicates, or ferrous, soluble iron compounds that can react with alkalis or water to form severe staining. Alkali-sensitive stones include some granites, Indiana limestone, and many types of sandstone, especially those that are green or grey in color. Glazed and polished surfaces tend to be damaged by both strong acids and strong alkalis. A poultice is ofen the preferred method of graffiti removal. Photo: NPS files. A variety of treatments are available from which to choose the most appropriate method of graffiti removal that will not damage the surface of historic masonry. Removal techniques, which are chosen according to the type of graffiti and the masonry, range from simply erasing pencilled graffiti with soft erasers, or removing chalked graffiti with soft brushes, to poulticing with water (with or without detergents), poulticing with organic solvents or alkali-based paint removers, or applying bleach to remove painted graffiti. In very limited situations, it may mean using very delicate and controlled abrasive means. Successful graffiti removal often requires a combination of cleaning materials and methods. The most effective method of removing graffiti from masonry usually involves the use of a poultice. A poultice consists of an absorbent material or powder-inert clays such as kaolin or sepiolite, diatomaceous earth (fuller's earth); or cellulose products such as fluff pulp cellulose or shredded paper-mixed with a cleaning solution (a liquid reagent such as water, organic solvent, paint stripper or bleach) to form a paste or slurry. The purpose of a poultice is twofold: it enables a cleaning solution to be kept in contact with the stained area as long as possible, while allowing the cleaning solution to pull the staining material out of the substrate via the poultice without redepositing it in, or restaining, the masonry. A poultice is often covered with a plastic sheet to retard evaporation. With some extremely porous types of stone, such as marble, although a poultice may remove a stain from one side of the stone, stains can pass completely through the stone and be redeposited on the other side of the masonry slab. Thus, caution should always be exercised in stain and graffiti removal. Painting over graffiti on stone is not a recommended maintenance treatment. Photo: NPS files. Graffiti removal from historic masonry should always begin with the gentlest means possible. In some instances, this means low-pressure water washing. Fresh graffiti-one or two days old-made with water-soluble markers may sometimes be removed with water, possibly aided by a neutral or non-ionic detergent. (Non-ionic detergents which do not ionize in solution, do not deposit a solid, visible residue.) Ammonia can also be effective in removing fresh graffiti. Any detergent should be approached with caution and tested before using because most commercial laundry detergents are not neutral and contain substances which may leave undesirable residues on masonry materials. Usually, the water and detergent should be mixed with an absorbent material and applied in the form of a poultice. Although water washing is often likely to be the gentlest cleaning method for historic masonry, it may not be as effective for removing graffiti because many graffiti materials are not soluble in water. Most graffiti can be removed without damaging the masonry with proprietary graffiti-removal products and commercial paint strippers containing organic solvents. But, these products should always be tested and used in accordance with manufacturer's instructions included in the product literature. Normally, solvents should be used in a poultice form to prevent them from penetrating into the substrate, and permanently discoloring or staining the masonry. A number of paint-removers are manufactured as thick gels or pastes that cling to the surface, and some commercial paint-removal products include a tough fiber-reinforced paper or cloth backing that retards evaporation and also facilitates neat and clean removal of the used stripper. The advantage of using organic solvents is that they evaporate completely, leaving no residual material in the masonry. However, organic solvents may present a severe health hazard, and workers using them must wear adequate protection. "Off-the-shelf" aerosol graffiti removers generally should not be used because the dissolved paint being removed may run down the wall "staining" a previously clean area; or pigments may also be redistributed by the rinsing and scrubbing recommended by the product manufacturer. Alkaline compounds may be used to remove some oils and greases, and waxes from non-alkali sensitive masonry. Like organic solvents, alkaline compounds should generally be used in conjunction with a poultice when removing graffiti. The use of alkaline compounds should always be followed by a weak acid wash and a water rinse in order to neutralize-or remove-all the alkaline residues from the masonry. Strong alkalies (pH13-14), such as sodium hydroxide-based paint removers (caustic soda or lye), generally should not be used as they can cause efflorescence and staining on masonry surfaces, if not properly neutralized. Potassium and other hydroxide paint removers may react with iron compounds in some masonry, particularly Indiana limestone, to form dark brown (rust-colored), or black ferric hydroxide stains, which are very difficult to remove. Alkali-based bleaches such as calcium hypochlorite can sometimes be used very successfully in a poultice to bleach or decolorize certain dyes contained in some paints and inks that cannot readily be removed by other means. 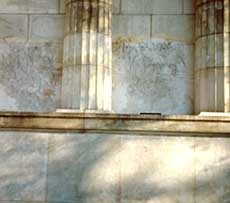 Damaging graffiti removal methods have scarred the marble. Photo: NPS files. Mechanical treatments include dry or wet blasting, using abrasive grits, such as sand, dolomite powder, aluminum oxide, ground-walnut shells, sodium bicarbonate (baking soda), and others; high-pressure water washing; and mechanical sanding or grinding. All of these abrasive methods will cause damage to masonry and, in most instances, should never be considered as a method of removing graffiti from historic masonry. Abrasive methods used mistakenly by untrained workers to remove graffiti usually result in etching the outline of the graffiti permanently into the masonry. Some historic masonry materials can be easily damaged by pressure washing even at low or moderate pressures (100-400 psi). Occasionally, however, under very controlled circumstances, a micro-abrasive technique may be appropriate for removing graffiti from delicate masonry surfaces, if used at low pressures of 35-40 psi with fine abrasives. This treatment, which must be done very slowly and carefully to avoid damaging the masonry, should be tested first, and undertaken only by a professional conservator. 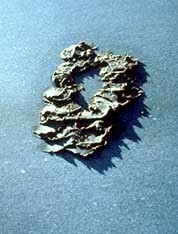 Another exception, even though it is not strictly an abrasive treatment, is using a razor blade as a first step to remove spray paint or felt-tip marker from polished granite. However, this too, should be undertaken only by a professional conservator, and only on polished granite, which is very hard and generally impervious to scratches. Although not in general use as a cleaning technique, laser technology offers great promise in the future as a non-damaging method of graffiti removal. Before selecting a removal method, all cleaning materials and techniques for removing graffiti from a historic masonry building should be tested on mock-ups or areas of the resource that are not highly visible, but which are representative of typical conditions. Visual observation should be supplemented by the use of a magnifying glass, and spot tests should be carried out with various solvents to help identify the specific graffiti medium, which will aid in its removal. More complex testing using laboratory equipment and more scientific analytical processes may sometimes be necessary in complex situations. Sample areas that represent the desired degree of "cleanliness" should be approved in writing by client, architect, conservator or other appropriate authority. The materials and all the other data necessary to reproduce the desired cleaning results should be meticulously recorded and the accepted sample area preserved for reference until the end of the job. The existence of a "clean" sample for comparison and a signed agreement can avoid unpleasant surprises, misunderstandings, and perhaps legal actions. Most of the chemicals used for graffiti removal are dangerous to workers, as well as to others who may be in the vicinity. Organic solvents are toxic by ingestion, inhalation, and skin contact. Material Safety Data Sheets (MSDS), available from the product manufacturer for all paint-removal products, should always be consulted and followed. Identification of hazardous components and checking with chemical reference works will help assure that the least hazardous, but most effective, products are selected. Generally speaking, it is a sensible policy to carry out all graffiti removal in well-ventilated conditions. Some solvents can be used only outdoors, and sometimes forced ventilation may be necessary even there, requiring workers to use air-fed respiratory equipment to avoid wind-blown fumes. Smoking, eating or drinking must not be allowed when cleaning is in progress. Some materials used for graffiti removal are so corrosive that accidental contact can cause serious, permanent scarring and painful injuries. Wearing appropriate protective clothing must be strictly enforced. Mandatory personal protective equipment (PPE) normally includes face shields or safety glasses; long, chemical-resistant gloves; face masks with respirators for organic solvents; and possibly, full protective clothing with an independent air supply. All smoking and open flames should be rigorously excluded from work areas; many solvents are flammable or highly explosive in vapor or liquid form when mixed with air. Solvent residue, used swabs, cloths, overalls and all other solvent-contaminated items should be safely and legally disposed of, or properly stored-even overnight-away from potential sources of fire. Electrical equipment may require explosion-proof fittings when used with certain solvents. When electric pumps and pressure-spraying equipment are used, it is especially important that all necessary precautions be taken to avoid electric shock. Water sprays and puddles on the ground present a potentially dangerous situation, if they come into contact with temporary wiring at worksites where graffiti is being removed. Such hazards must be carefully monitored and controlled. As with any construction project, attention should always be directed toward the general safety of the workers and passers-by, but also toward possible damage to the resource itself that might result from careless placement of ladders, or scaffolding. Chemicals used for masonry cleaning can also damage adjacent metals, glass, and painted surfaces, as well as vegetation. Product manufacturers' instructions should always be closely followed to avoid such inadvertent "collateral" damage. To protect against environmental contamination, including the formation of unwanted ozone at ground level and damage to the ozone layer in the earth's outer atmosphere, legislation has been enacted in some states making it illegal to use even moderate quantities of some solvents—volatile organic compounds (VOCs) contained in paint removers. In response to this legislation, many new products are being developed that do not contain VOCs. After completing graffiti removal, the disposal of chemical products and rinsing effluent must be taken into account. Arrangement for disposal of the cleaning waste should be made prior to beginning graffiti removal, especially if it is a project of considerable size. In many places it is illegal to discharge solvents and/or paint residues into sewers or storm drains. The owner or manager of a historic property, or in some cases the individual or firm doing the cleaning or graffiti removal, is responsible for being informed of, and complying with, relevant laws and regulations. Under provisions of the National Historic Preservation Act of 1966, as amended, approval may be required from a state or federal preservation agency before any work can be undertaken on buildings or structures listed in or eligible for listing in the National Register of Historic Places, if such a project involves federal funding or licensing. Many state and local historic district commissions and review boards have their own regulations that require approval for cleaning or graffiti removal work that is undertaken on landmarks or properties in locally designated historic districts. Anti-graffiti or barrier coatings are intended to facilitate the removal of graffiti from porous as well as non-porous surfaces. These coatings are most commonly transparent, but may also be pigmented. They are available in a variety of formulations designed to serve different needs. The use of barrier coatings to protect graffiti-prone historic masonry surfaces may seem to be an easy preventive solution to a persistent graffiti problem. However, for the most part, these coatings are not the panacea that some advertising might suggest. Some of them simply do not work, and others may cause physical or aesthetic changes or damage to the masonry. Transparent coatings serve as a barrier between the masonry surface and graffiti, preventing graffiti from penetrating into the masonry. They are also intended to make graffiti removal easier since most graffiti does not adhere well to them. Generally, graffiti applied over transparent barrier coatings can be removed with low-pressure water and a detergent, or with a solvent. The difference in color between the bottom and the top of the stone spandrel is the only clue to the presence of a clear barrier coating. Photo: NPS files. Unfortunately, in application, there are a number of negative aspects of transparent barrier coatings that generally prevent their being recommended for use on historic masonry. First, clear coatings may alter the color of the masonry surface and add a gloss that may be highly visible, or apparent only in certain lighting conditions or when it rains. Second, clear coatings may reduce the water-vapor permeability of the masonry, thereby contributing to possible water-related deterioration. Third, the coating may discolor and change over time. Exposure to ultra-violet light can cause a coating to yellow; dirt build-up may darken the treated surface; and some coatings acquire a sheen when rubbed or brushed against. Such changes are especially noticeable when only a portion of the building has been coated. Furthermore, if coatings are not maintained on a regular basis, usually through periodic removal and reapplication, many coatings tend to fail. What often results is an uneven, "patchy" look to the masonry that can have a very negative impact on the character of the historic building. Despite these potential drawbacks, there may be some instances in which the graffiti problem or frequency of occurrence is so severe that application of a transparent barrier coating on historic masonry may be worth considering. Some water-base polysaccharide coatings, and silicone and silicone-base coatings have been used with success on masonry structures. They are essentially invisible, and do not change the natural appearance of the masonry. Although less durable than solvent-borne coatings, they are water-vapor permeable (breathable), and may be reapplied to the masonry surface immediately after removing graffiti, while the surface is still damp. However, extreme caution must be exercised before applying a transparent barrier coating. Experimental test applications should always be tried first on discrete areas that are not highly visible, and the treated areas evaluated over a period of time. Laboratory test results on the performance of coatings applied to samples of like masonry types may be useful to some extent. But because the tests are carried out in a controlled environment, they may not be as accurate or reliable as tests actually carried out on-site where the factors of weather and pollution are the same as those at the location where the coating will be used. If circumstances warrant, and the use of a barrier coating is determined necessary, an architectural conservator should evaluate the test performance of a variety of coatings before selecting one to be applied to historic masonry. Because of the potential for disfigurement, owners of landmark-designated buildings are required by some preservation review boards and landmark commissions to obtain approval before they apply a barrier coating. A pigmented barrier coating may be used on masonry as a permanent, preventive barrier coating, or as a temporary means of concealing graffiti until it can be removed. This formerly clear barrier coating is very shiny and has discolored as it has aged. Photo: NPS files. Like a transparent barrier coating, a pigmented barrier coating facilitates the removal of graffiti because graffiti does not adhere well to it. Pigmented barrier coatings that are water-vapor permeable may sometimes be used as a permanent barrier coating on non-historic masonry where there is frequent recurrence of graffiti, and when constant surveillance is not possible. Although there are some instances in which pigmented barrier coatings may be appropriate on painted historic masonry, they are not recommended for unpainted historic masonry because they will change the appearance of the masonry. There is also another kind of pigmented coating that is specially formulated to be used as a temporary measure to conceal graffiti that cannot be removed right away. 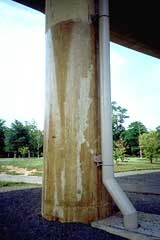 This temporary, vapor-permeable paint is removed when the graffiti is removed. Pigmented coatings are also not generally recommended as a permanent measure to cover up graffiti. 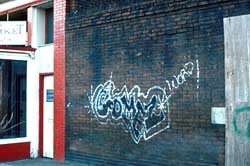 Some graffiti materials, particularly felt markers, bleed through the coating; and repeated applications of the coating or paint can result in a heavy paint build-up on a masonry surface. Another disadvantage of using paint or a pigmented coating to hide graffiti is that it usually appears as an obvious patch on unpainted masonry and tends to attract more graffiti unless the paint can be applied in a discrete, and well-defined area. If incompatible with either the masonry or the graffiti, such a coating may peel off the masonry surface in an unsightly manner. Like transparent coatings, pigmented coatings may be difficult or impossible to remove completely once their performance or appearance is no longer satisfactory. Experience shows that prompt removal of graffiti is one of the most effective measures against its recurrence. Graffiti that is not removed quickly tends to attract more graffiti. Often motivated by a need to have their work seen, graffitists tend to be discouraged from repeating their efforts in a location where their work is quickly removed. Neglect invites vandalism, whereas a well-maintained property encourages civic pride. Thus, careful attention should be given to establishing regular maintenance programs which do not allow properties to reach a point of obvious deterioration or abandonment. Cyclical maintenance also makes good sense economically. Graffiti is less likely to occur if graffitists can be clearly seen. It is often recommended that accessible, graffiti-prone areas be illuminated with floodlighting or spotlights. Graffiti may also be reduced or prevented by the presence of security guards, park rangers or police officers, or by the visible presence of surveillance cameras. Publicity about arrests and punitive measures against the graffitists, and the general vigilance of the security system may also reduce graffiti. If they are historically appropriate and compatible with the historic property, soft barriers in the form of low, possibly thorny, shrubs and bushes or other forms of landscaping and planting may be effective deterrents. Such plantings can make it difficult to reach the property by any route other than the approved secure one. Hard barriers provided by fences and transparent screens or shields, such as clear acrylic or other polycarbonate sheets, may also afford some degree of protection. But these can have a negative aesthetic impact on the property's appearance, particularly if the barriers themselves become disfigured by graffiti. Community action and education often play an important role in a successful anti-graffiti program. Neighborhood watches can effectively deter graffitists, and can help police and other security agencies in the detection and prevention of graffiti. Intensive public campaigns against graffiti, including presentations in schools, developing programs to foster community pride, and sentencing offenders to remove graffiti in their own community can also be useful. Publicity concerning arrests of graffitists can be a useful preventive tool. (But, on the other hand, frequent newspaper coverage of graffiti outbreaks or even of new community efforts at deterring graffiti can sometimes have the opposite effect by challenging the "creativity" of graffitists.) Community groups trained in proper cleaning techniques can also assist property owners in prompt and non-damaging graffiti removal. 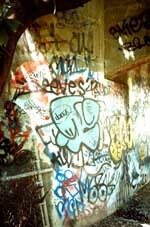 For managers or owners of historic masonry buildings, or agencies responsible for large inventories of graffiti-prone properties, including parks, highway and railroad bridges and viaducts, bus, train and subway stations, and cemeteries, the development of a treatment plan may be the first step toward an effective graffiti-removal program. It is becoming increasingly common for large or important historic properties to have regular maintenance and disaster plans that include graffiti removal. When feasible, a separate treatment plan should be prepared for each structure. However, if this is not possible, it is advisable to prepare a variety of treatment plans for specific masonry types. Plans should be prepared to cover all types of masonry that fall under one jurisdiction, management or ownership that are potential targets for graffiti. Guidance contained in treatment plans should be based on the results of carefully controlled testing to remove a wide variety of common graffiti materials safely, and without damaging the various types of masonry. Individual treatment plans should address all parts of the building or structure that could be disfigured by graffiti, and any features too fragile to be cleaned by anyone other than a conservator should be noted on the plan. health and safety concerns regarding specific removal treatments, product literature and Material Safety Data Sheets (MSDS). "Invisible" without gloss or sheen, when applied to masonry. No change in appearance from uncoated areas when masonry is wet. Does not discolor or attract dirt. Will the coating last long enough to offset its cost? Will the application and reapplication of the coating be cost effective? Will the coating be effective against more than one type of graffiti? Can the coating be completely and thoroughly removed, so that, if necessary, paint, or another coating will adhere to the masonry surface? Will the building ever need to be repointed or patched? A barrier coating may make this difficult or even impossible. Seek advice of an architectural conservator. Test coating on an inconspicuous area of masonry, or study the success/failure of the coating in other locations where it has been used. It is important to pre-wet the masonry surface when using an alkaline paint remover; it is also advisable to pre-wet the masonry surrounding a graffitied area to dilute the effect of any cleaning agents that might be inadvertently splashed or spilled on the unsoiled surface. Do not wet the area to be cleaned if the cleaning agent is solvent-based or incompatible with water. Always rinse the cleaning agent off the masonry surface starting at the bottom and moving up. This prevents the cleaning agent from running down and staining a lower surface. Air temperature can be a factor in graffiti removal. Most paint removers do not work when the air temperature is either very cold or very hot. This may sometimes explain why a method that worked in one instance may not be effective again in another, similar situation. Variations within the same type of stone, such as bedding planes, density, finish, or degree of weathering, may explain why some areas of the same stone sometimes clean better that others. Even if advance testing has been done and a treatment plan exists, at least some on-the-spot testing will probably be necessary. Mortar joints react differently from masonry units, and may require a different cleaning material and/or method to be cleaned effectively. Graffiti removal may result in an obviously "clean" spot. Always clean the entire masonry unit that is bounded by mortar joints (but not the joints themselves, unless necessary). The prominence of the clean spot may be minimized by fanning the cleaning out from the spot, and "feathering" it by gradually reducing the strength or thoroughness of the cleaning. If it is not possible to completely remove all traces of graffiti without removing some of the masonry surface, it may be preferable to leave the masonry alone. Some graffiti ghosts become less noticeable with time due to fading of the dyes used in paints and markers. Sometimes it may be possible to conceal more obvious graffiti ghosts with carefully-matched paint. After graffiti removal, the masonry surface should always be tested with Ph strips to make sure all the cleaning materials have been completely removed. Non-staining Ph strips, available from chemical supply companies, will indicate whether acids or alkalis remain on the masonry surface. Although alkaline paint removers are sometimes ineffective on modern formulations of aerosol paints, they can work well in removing multi-layered graffiti because they last longer. What removes graffiti in one instance may not always work again even in what appears to be an identical situation. More than one cleaning material and technique may be required to clean a heavily graffitied area if different materials were used to make the graffiti. For example, shapes are often outlined with broad-tipped felt markers and then filled in with spray paint. Effective graffiti removal often depends on trial-and-error testing, as well as a knowledge of masonry materials, graffiti materials and cleaning techniques. Although rapid graffiti removal is the most effective weapon in eliminating graffiti and preventing its recurrence in the same location, hasty, untested removal attempts can disfigure and cause harm to historic masonry. Thus, it is important that the owner or manager of a historic masonry building or structure be prepared with a plan to ensure the prompt removal of graffiti when it occurs. Regularly scheduled maintenance and cleaning programs to eliminate graffiti from historic masonry properties may be assisted by the installation of physical barriers, security systems and lighting, as well as increased community involvement. Successful graffiti removal from historic masonry requires knowledge of a variety of cleaning methods and materials, and an awareness that what works to remove graffiti from one kind of masonry surface may not remove it from another. By testing different cleaning methods in advance, treatment plans will be available, when needed, to provide guidance for safe and sensitive graffiti removal from historic masonry. This Preservation Brief was developed under a cooperative agreement between the New York Landmarks Conservancy and the National Park Service. Mark A. Weber, Director, Technical Services Center, served as project coordinator for the Conservancy. The author, Martin E. Weaver, is the Director of the Center for Preservation Research at Columbia University. He is an internationally recognized expert in the conservation of architectural and cultural resources, a noted lecturer, and author of Conserving Buildings: A Guide to Techniques and Materials, as well as numerous articles on the subject. Anne E. Grimmer, Senior Architectural Historian, Technical Preservation Services, Preservation Assistance Division, National Park Service, coordinated the development of this Preservation Brief and served as Technical Editor. Technical review of this publication by the following is gratefully acknowledged: Frances Gale, Training Coordinator, National Center for Preservation Technology and Training, National Park Service, Natchitoches, LA; Judith M. Jacob, Architectural Conservator, Building Conservation Branch, Northeast Cultural Resources Center, National Park Service, NY, NY; Andrea Mones-O'Hara, Regional Historic Preservation Officer, National Capital Region, General Services Administration, Washington, DC; Nicolas F. Veloz, Conservator of Outdoor Sculpture and Monuments, National Capital Area Office, National Park Service, Washington, DC; and Michael J. Auer, Timothy Buehner, Charles E. Fisher, and especially Kay D. Weeks, Preservation Assistance Division, National Park Service. American Geological Institute. AGI Glossary of Geology and Related Sciences . Washington, D.C.: American Geological Institute, 1960. Ashurst, Nicola. Cleaning Historic Buildings. Vol. I: Substrates, Soiling and Investigations; Vol. II: Cleaning Materials and Processes . London: Donhead Publishing Ltd., 1994. "Chemistry Leaves Its Mark on Graffiti." Chemical Marketing Reporter. November 14, 1993. Ehrenkrantz and Eckstut Architects, P.C. Technical Tips: Removing Graffiti . New York: New York Landmarks Conservancy, n.d. (1994). Graffiti Removal Manual. Providence, RI: Keep Providence Beautiful, September 1986. Grimmer, Anne E. Keeping it Clean: Removing Exterior Dirt, Paint, Stains and Graffiti from Historic Masonry Buildings. Washington, D.C.: Preservation Assistance Division, National Park Service, U.S. Department of the Interior, 1988. Lewis, Richard J. Hazardous Chemicals Desk Reference. Second Edition. New York: Van Nostrand Reinhold, 1991. NIOSH Pocket Guide to Chemical Hazards . Washington, D.C.: National Institute for Occupational Safety and Health, Centers for Disease Control and Prevention, Public Health Service, U.S. Department of Health and Human Services, June 1994. Reisner, Robert. Graffiti: Two Thousand Years of Wall Writing. Chicago: Cowles Book Company, 1971. Science for Conservators: Conservation Teaching Series . The Conservation Unit of the Museums and Galleries Commission. 3 volumes. New York: Routledge, A Division of Routledge, Chapman and Hall, Inc., 1992. Torraca, Giorgio. Porous Building Materials . Rome: ICCROM, 1988. Torraca, Giorgio. Solubility and Solvents for Conservation Problems. Rome: ICCROM, 1990. Weaver, Martin E. Conserving Buildings: A Guide to Techniques and Materials. 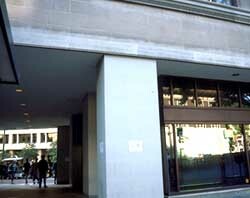 New York: John Wiley and Sons, Inc., 1993. Whitford, Maurice J. Getting Rid of Graffiti: A practical guide to graffiti removal and anti-graffiti protection. New York: Van Nostrand Reinhold, Inc., 1992. Wollbrinck, Thomas. "The Composition of Proprietary Paint Strippers." Journal of the American Institute for Conservation. Vol. 32 (1993), pp. 43-57. Young, Daniel J. How to Comply with the OSHA Hazard Communication Standard: A Guide to Compliance with OSHA Worker Right-to-Know Regulations. New York: Van Nostrand Reinhold, 1989.